It’s tempting to call City of Heroes a venerable MMO, such was its stature, but to do so makes it sound dry and dusty. Cryptic Games’ grand metropolis wasn’t either of those things. It was vibrant and magnetic, a game of superhero dress-up where flying was the only way to travel. Read more: the best MMOs on the PC. 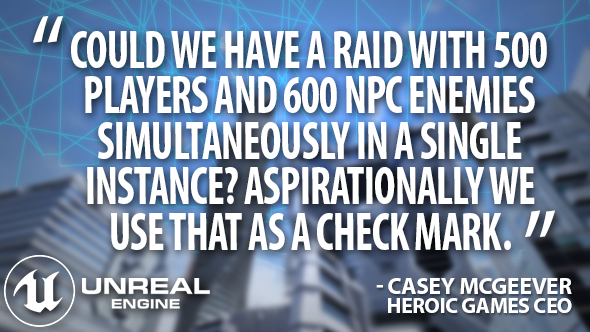 Strategy consultant and lifelong MMO player Casey McGeever was still playing City of Heroes in 2012, when the game’s last remaining residents gathered in central Atlas Park to give Paragon City a proper send-off. 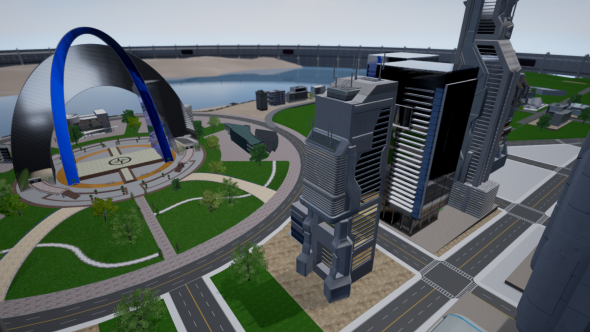 McGeever has since become CEO of Heroic Games, a studio dedicated to rebottling the optimistic spirit that powered City of Heroes in a new body: Ship of Heroes. But how do you go from nothing – an independent studio with no games to its name – to a working MMO? Don’t those things have to have open worlds? Servers? Netcode? Heroic have coped with the scale by starting small. In Ship of Heroes lore, a united humankind is travelling through space aboard the FHS Justice, where tens of millions occupy simulated idylls. Apotheosis City, the gleaming patchwork of skyscrapers Heroic are building now, is just one. There are windows in the hull of the simulated Apotheosis City. They show the stars outside, giving Ship of Heroes’ sci-fi lore a foothold in its world. But when Wilson spins the camera outside the map, it becomes clear there is no huge, starry skybox at all – simply a flat window pane and some technical trickery. As the player moves, the 2D image of space shifts from side to side to match their perspective. In a fashion reminiscent of Sonic’s parallax scrolling, it gives the illusion of a much larger world outside. “Tricky, tricky,” says Wilson, happily. Heroic have the unenviable task of preparing for massive player numbers they can’t yet test. Surely there’s a lot of guesswork involved in building a platform that can take the strain? “There are several tools within Unreal Engine 4 that allow you to check things, such as texture streaming and the light, and allow you to determine minimum specifications as you’re building,” adds lead developer Matthew Wilson. Even as Heroic raise Apotheosis City from the ground they’re testing for potential pitfalls, like texture resolution and overall poly-counts, in the Unreal editor. MMOs are famous – notorious, even – for steadily-paced cooldown combat. It’s a tradition born from necessity. Faced with huge numbers of international players and high latency – i.e. the time between you selecting to cast a fireball and the transfer of that instruction to the server – early MMO developers designed combat systems that didn’t rely too heavily on second-to-second action and the frequent transfer of data. Like many creative decisions forced by technical limitation, however, cooldown-based MMO combat has developed into a much-loved style. One of the greatest technical hurdles Ship of Heroes has to overcome is one of the least appreciated: character creation. 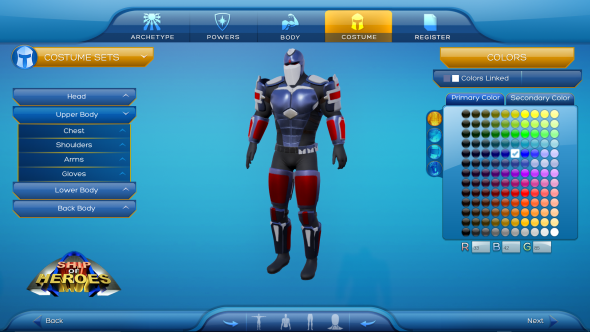 Wilson has done his homework on morphing – the tech that allows a character creator’s sliders to deform object meshes and so change the shape of a character’s body. One morph might increase the size of their chest, for instance, while another builds muscle – extending that chest still further. Part of Wilson’s job is ensuring that when morphs combine, they don’t take the character into proportions that are completely absurd. “We don’t want people to have chests that extend out five feet from their character through a combination of various morphs,” he notes. Whenever the team make a new morph, they test-combine it with every other morph in the creator to keep things sensible. Not something the developers of Saints Row or The Sims 2 seemed to bother with. Clearly, costumes are hugely important in a game about superheroes – but clothing is a whole other wardrobe of potential nightmares. 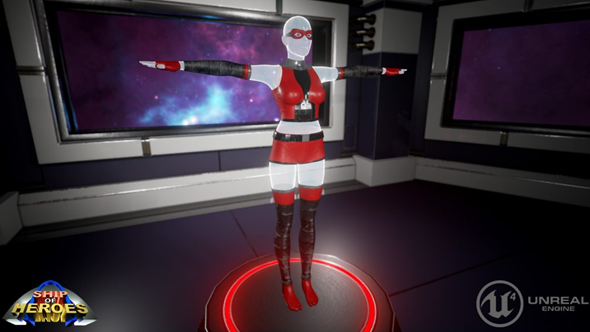 Ship of Heroes currently has 11 customisable clothing slots on each character, and there will be more. You might have equipped a shirt that hangs down below the waist (recklessly ignoring the advice of The Incredibles’ Edna on low-hanging articles of superhero clothing). But if you’re also wearing trousers, those two items need to talk to each other so they know how to interact. In this instance, the shirt may tuck in, to avoid clipping through the pants. In this way, Heroic avoid what could be major distractions in an avatar you follow around for hundreds of hours. It’s an essential detail in a game which, like City of Heroes, is all about following a character into peril and adventure. 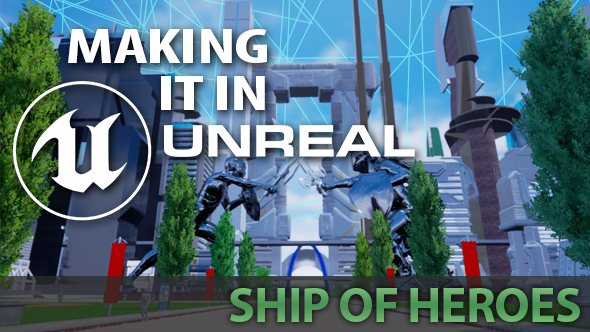 Heroic are planning a Kickstarter for Ship of Heroes beginning in April.Unreal Engine 4 is now free. In this sponsored series, we’re looking at how game developers are taking advantage of Unreal Engine 4 to create a new generation of PC games. With thanks to Epic Games and Heroic Games.